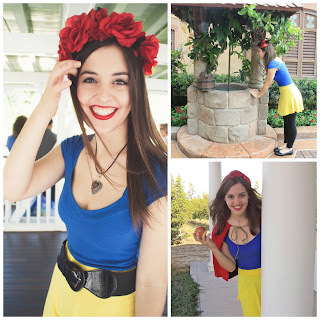 When I first got involved with DisneyBounding, it was Halloween 2012. I wanted to dress up as Snow White, but didn't want the full on fancy dress. 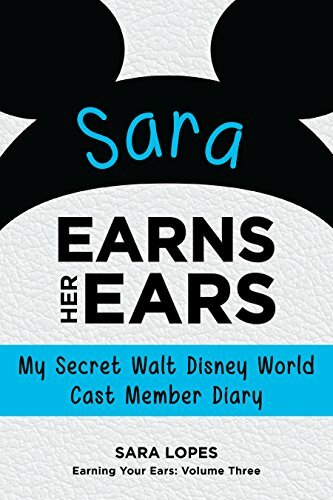 I decided to take a stab at DisneyBounding, searching through my closet to see what I already had, and what I might need to purchase to finish the look. I was surprised with how well everything was pulled together, and to this day it's one of my favorite DisneyBounds I've ever put together. I've done a couple varieties of this DisneyBound, wearing it at home for Halloween, Walt Disney World during my college program, and in Disneyland for a photoshoot with my lovely friend Courtney. This DisneyBound is probably one of the most common outfits, but that's probably because it's rather simple. As long as you can put together an outfit that includes yellow, blue, and hints of red, you're set! Here are the various pieces that I've included for the different versions of the Snow White DisneyBounds I've put together in the past! Blue Shirt: I've actually owned this shirt for years in my drawer back home, but I just never wore it much until I started using this DisneyBound. Finding a solid blue shirt shouldn't be too hard, but I definitely recommend Forever 21 for solid colored clothes! I find plenty of my clothing pieces for DisneyBounding there. Yellow Skirt: I purchased this skirt on CharlotteRuse.com nearly four years ago, so it doesn't look like they have the exact same skirt on their website anymore. However, any yellow skirt can work! I found a skater skirt at Forever 21 here as an affordable option! Red Bow: My first couple times wearing this outfit included a red hairband bow from Claires! 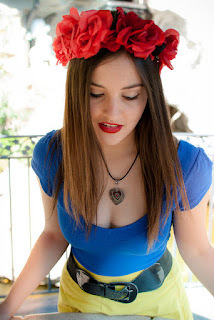 Red Flower Crown: Third time I wore this DisneyBound included a red flower crown from my lovely friend Sidonie Smith. It's actually Incredibles themed (with small black flowers between the red ones), but I thought it looked great with my Snow White getup! You can find more creations from Sid and her husband on YourCosplayCloset! Necklace: Jewelry can really finish a DisneyBound outfit. I didn't have any my first time, but the second and third time I used two different red heart necklaces. One was borrowed from a friend, and the other (on the left photo) was one my mom actually made herself. Other jewelry pieces such as apple necklaces or earrings would look great with this outfit! Black Belt: Completely optional to use a belt, I just felt like adding it during the photoshoot to add a bit of a change to the look than my previous outfits. You can also use the belt as a way to add red or any other color within the character's scheme! Black Flats: Shoe color is pretty optional here, but black flats were the easiest shoes I had in my closet at the time. Whichever you find works the best for you! What are some of your favorite DisneyBounds? Be sure to follow The Disney Den on Facebook, Twitter, and Youtube!